Art world provocateur and King of the banal Jeff Koons has made art out of anything and everything. The critics love to hate it, but the public can’t seem to get enough. His overwhelming success is thus a bit of an enigma. So "hey", he thinks…"why not sandwiches?" 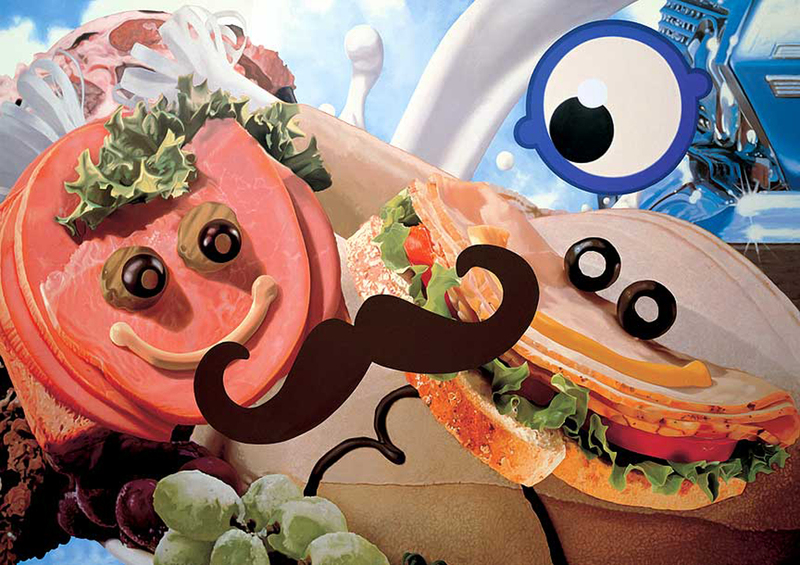 In his Easyfun-Ethereal series, Koons decides to take ordinary lunch fare to epic proportions with this 9 by 14 foot bizarre painting of smiling deli meats. The museum that owns the painting is quick to legitimize the somewhat silly result in art historical terms, shying away from potential stoner fans (not to say that a marijuana habit and love for learning are mutually exclusive!) The collage effect and color scheme reference Pop Art (like Andy Warhol). The shiny metal grill in the upper right corner acts as an homage to the work of James Rosenquist and also, perhaps to artists in 1960s California who loved the sleek new designs of what we now term “classic” cars. If you take the Guggenheim’s word for it, the trippy mishmash of cartoon imagery is inspired by Surrealism, the mustache a nod to Salvador Dali, and the splashing milk in the background a “wassup” to the drip paintings of Jackson Pollock. While all these observations are feasible, when it comes to artistic intent I would take that mess like I take my side of fries: with several grains of salt. It seems to me Koons is bolstered by his seeming inability to fail, despite everyone’s boredom with his deadpan, kitsch, auction-house sorcery. The only genuine response this work elicits from me? A distinct craving for toasted rye.